The master-planned project will be located in Compostela and will have five hotels—including a luxury Fairmont property—as well as over 2,500 residential units, a beach club and a PGA category golf course designed by Lorena Ochoa and Greg Norman. In a press conference held during the 41st Tianguis Turístico event in Guadalajara, Jalisco, Roberto Sandoval Castañeda, the Governor of the State of Nayarit, and Mexico’s Secretary of Tourism, Enrique de la Madrid, together announced the new Costa Canuva project, the newest tourism complex to be built in the Riviera Nayarit. “What was once Costa Capomo is now Costa Canuva—and the project is on,” assured the Governor in reference to the master-planned community of Costa Canuva, located in the municipality of Compostela. With an estimated investment of MEX$36 billion by Portuguese company Mota-Engil, the project will generate six thousand direct jobs and another 18 thousand indirect jobs. “Today we’re announcing the creation of seven thousand new rooms between the residences, apartments, condominiums and hotels; and we have made the commitment to remove any obstacles [to the project]. This is the first new development created by the Government of the Republic in the Riviera Nayarit,” said Sandoval Castañeda, who pointed out the excellent Ochoa-Norman collaboration was only missing the best development in the world—the Riviera Nayarit. “We're celebrating this joint effort between Mexico, Portuguese and North American enterprise and distinguished Mexicans, and we’re congratulating ourselves on this very important, very powerful investment that will contribute to the development of Nayarit as well as that of the Mexican people,” announced De la Madrid Cordero. The 18-hole PGA-category golf course will be built across 71 hectares; two holes will be parallel to the ocean and another two will have extraordinary views. 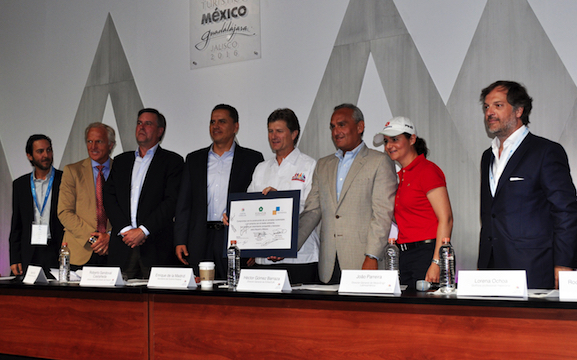 It will be the first golf course ever co-designed by ex-golfers Lorena Ochoa of Mexico and Australia’s Greg Norman. Construction will begin soon; the first stage is expected to be finished by 2017.